Inexpensive 0.5 kVA contact voltage regulator for generator, single phase. The rated input voltage is 220V, and rated output voltage is 0-250V, 0.8A rated output current, direct sale by manufacturer, very convenient. 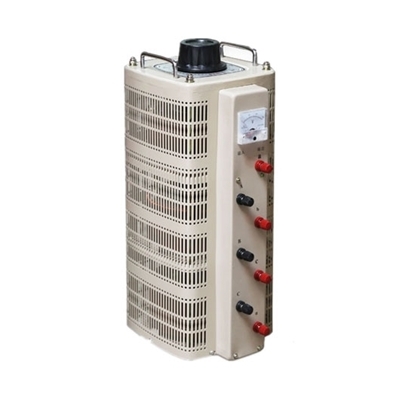 Favorable price 1 kVA single phase contact voltage regulator, with 4A rated output current and 0-250V rated output voltage, strong overload capacity, manufacturer direct sale. 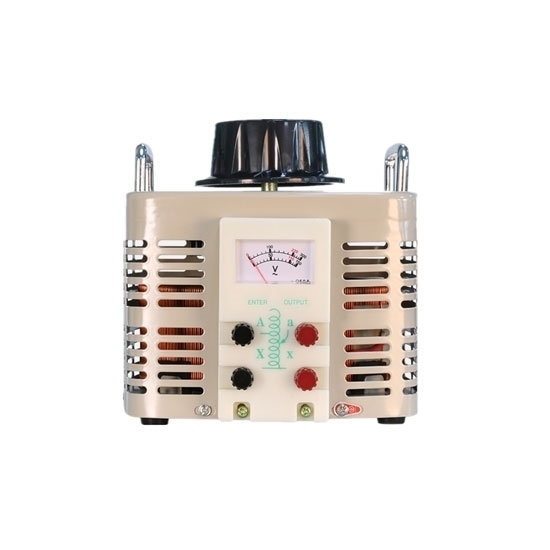 Economic 3 phase contact voltage regulator, with 1.5 kVA and 2A rated output current, direct sale by manufacturer in wholesale price. Low cost 10 kVA single phase contact voltage regulator, 40A rated output current, with 220V rated input voltage and 0-220V rated output voltage, manufactured direct sale. 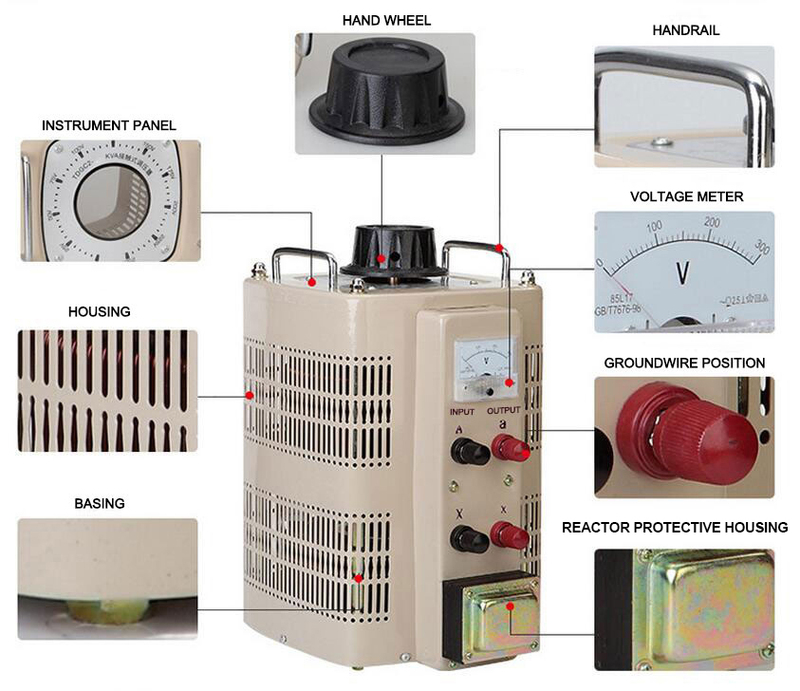 Good performance contact voltage regulator, 15 kVA and single phase for generator, the rated output current is 60A and rated output voltage is 0-250V. Direct sale by factory and convenient for you. Affordable 2 kVA contact voltage regulator, its rated output current is 8A, with 220V rated input voltage and 0-250V rated output voltage, single phase for generator, brand new direct sale by factory. 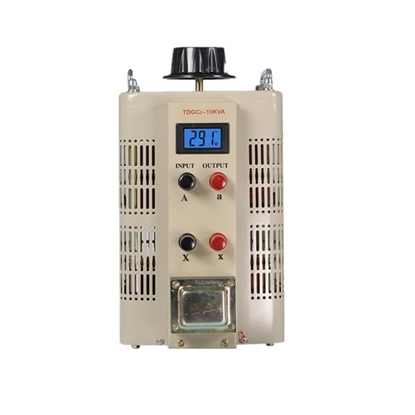 0.5 kVA light weight and high efficiency variac voltage regulator, 0.8A rated output current, with 50 Hz working frequency, it is really a ideal AC voltage regulating power supply. Before use, it must be ascertained that the grid voltage is the same as the input voltage terminal, and the input output should not be reversed. Before energizing, the pointer should be slowly turned to the required voltage at zero position, and should not be less than 5 seconds from zero to maximum. The regulator should be kept clean and protected from moisture and should be ventilated during use. Do not use the handwheel when handling the regulator, but lift the entire product. After the regulator is used, the hand should be turned to zero position and the power should be cut off. Works for what I needed it for. Works like a charm! I love it! Highly recommend!